On Friday, I gave out three moleskine notebooks, labelled with their intended destination and including a set of instructions from the original post over here. 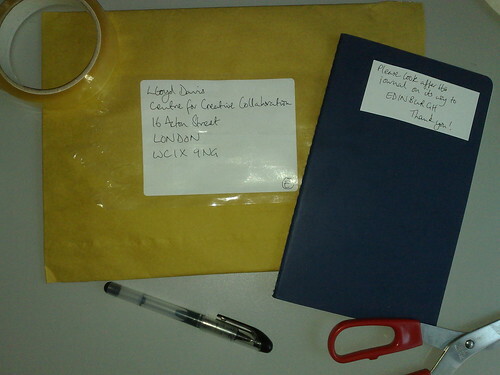 Each journal also comes in a stamped addressed jiffy bag so that they can come back to me at the end of the month. They went to two people who were working in #C4CC that afternoon and one person who I had coffee with later. There was a wrench to giving them up – I felt very responsible for making sure that they got on their way OK and that the people I'd given them to understood the instructions. It's a surprise to me whenever this happens. I make a great deal of the importance of "letting go" but when it comes down to it, I don't find it that easy myself.